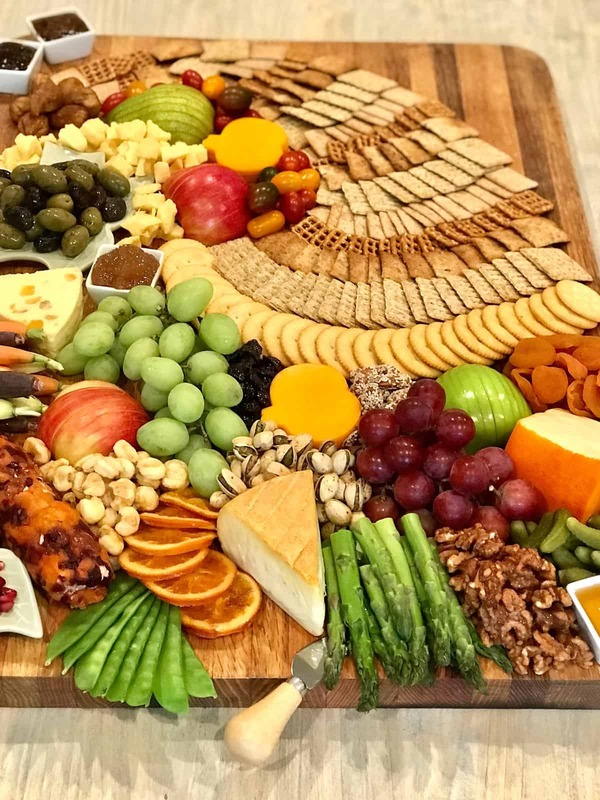 How to make a fabulous Cornucopia Cheese Board with a variety of crunchy snacks shaped like a cornucopia and an enticing selection of fall cheeses, fruits, vegetables, nuts and more for your Thanksgiving gathering enjoyment! 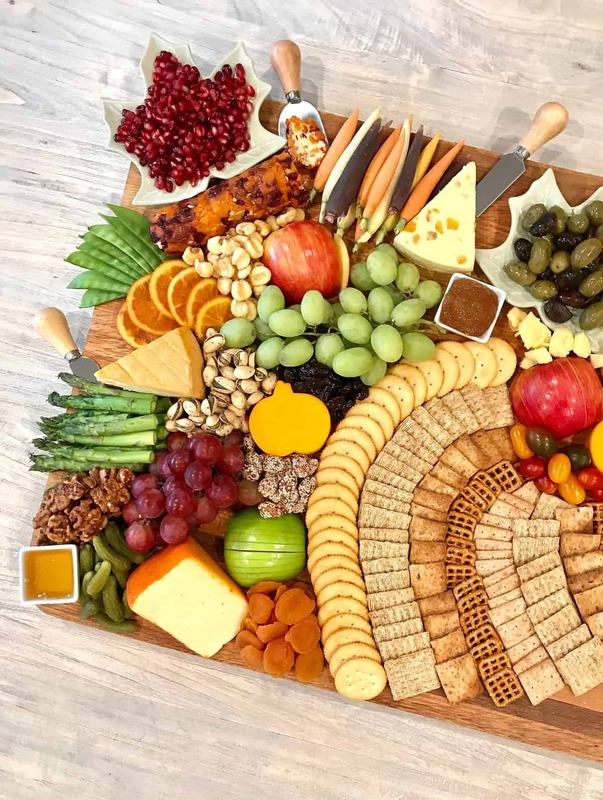 Take your cheese board game to the next level on Thanksgiving by making this gorgeous snackable spread of an edible cornucopia overflowing with fall-flavored cheeses and plenty of fruits, vegetables, nuts and more. Your family and friends are sure to love grazing on it throughout the day! 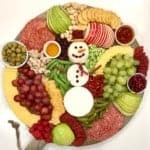 I love making our food fun and festive around the holidays. It makes it even more special and you can just feel the excitement and appreciation from those you make and enjoy it with. 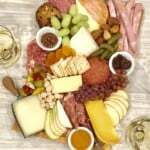 This Cornucopia Cheese Board is so beautiful in both sight and taste. It could serve as the centerpiece to your Thanksgiving table and is sure to be the center of attention until it’s all gobbled up. 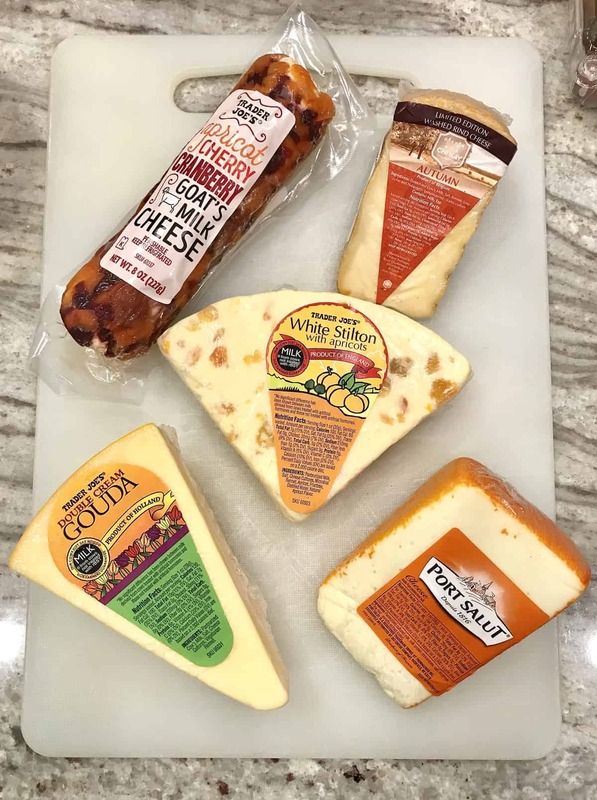 Next comes the cheeses which I got from Trader Joe’s. 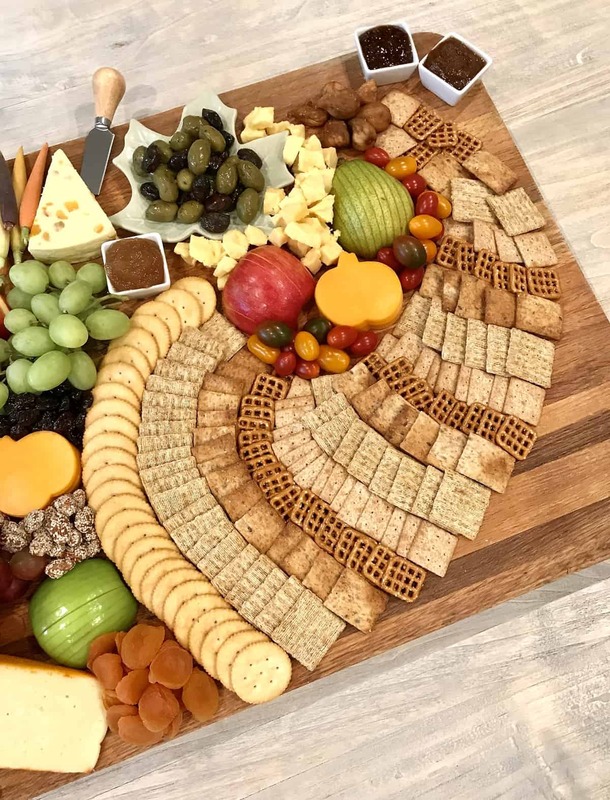 I then placed the cheeses on the board followed by all the fresh fruits and vegetables before filling it in with a variety of nuts and dried fruits. Everything, except some of the crunchy snacks, came from Trader Joe’s. Here’s what all I used, but you can certainly build the board to your liking by using your favorite variety of cheese board goodies: green grapes, red grapes, green apple, red apple, pear, asparagus, sugar peas, les petites carrots of many colors, mini heirloom tomatoes, pomegranate seeds, marinated olives, dried apricots, dried cherries, dried orange slices, cornichons, candied walnuts, sesame honey almonds, salt & pepper pistachios, Giant Peruvian Inca Corn, honey, fig jam, apple jam, and pumpkin butter. 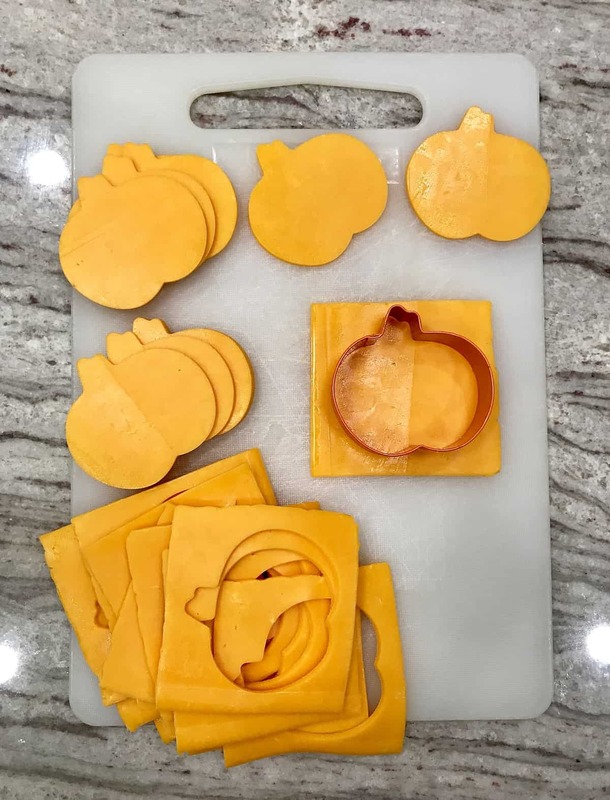 For the apples and pear, I cut each one in half, cored it with a knife while still keeping it in its shape, turned it cut/cored side down on a cutting board and thinly sliced it with a sharp knife. I put them on the board, cut side down, so they kept their original apple and pear shape. This was both for looks and to keep them from turning brown. I put the pomegranate seeds and olives on these cute little leaf-shaped plates I found in the seasonal bargain section at Target. 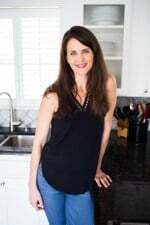 I’ve also seen similar ones at Sur La Table and Williams Sonoma. I put the honey, fig jam, apple jam and pumpkin butter in some mini white square tasting bowls from World Market. And that’s all there is to it! 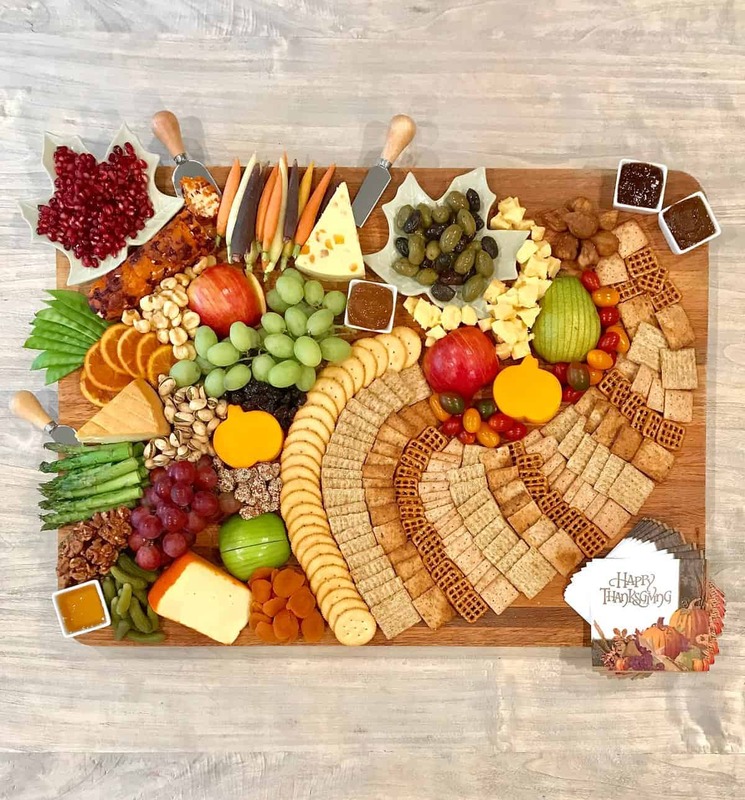 It’s a little bit more ambitious than your traditional cheese board spread, but so worth it for the fun and festiveness it creates for your crowd on Thanksgiving! 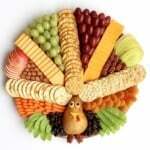 Hope you have a wonderful Thanksgiving with your loved ones. Enjoy! 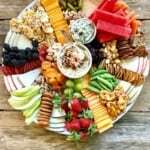 How to make a fabulous Cornucopia Cheese Board with a variety of salty snacks shaped like a cornucopia and an enticing selection of fall cheeses, fruits, vegetables, nuts and more for your Thanksgiving gathering enjoyment! On a large rectangular-shaped wood board, start by forming a cornucopia horn shape from the widest part and curve around to make a tip. Alternate with a variety of salty snacks and end with the dried brown figs for the tip. 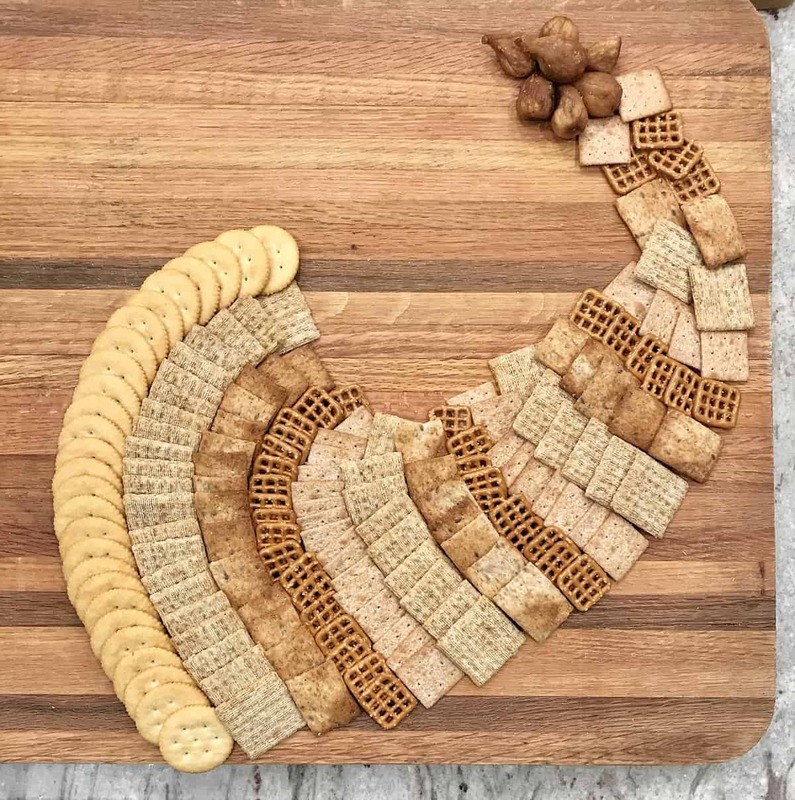 I used Ritz crackers, Triscuit crackers, multi-grain pita chips, pretzel snaps and Wheat Thins crackers. You want the remaining ingredients to look like they're overflowing out of the cornucopia. Space the cheeses out on the board followed by the fresh fruits and vegetables. Place the pomegranate seeds and olives on small leaf-shaped serving plates and then place the plates on the board. 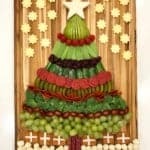 Fill in the space between the cheeses, fruits and vegetables with the dried fruits and nuts. Put the honey, fig jam, apple jam and pumpkin butter in mini serving bowls and space them out on the board. Put out some cheese knives for people to slice the cheeses with. Serve and enjoy!